Howard Lovey of Calmuet Editions recently interviewed our very own Brickyard Creek developer, David Culberson about his newest novel. You can learn more about both of David’s books, Alterio’s Motive and the recently revised and republished second edition​ of Back Time On Love City on Amazon and other online book distributors. How did a self-described “tree-hugging developer” end up writing a crime thriller involving Mexican drug cartels? Well, says author David Culberson, he could have written an academic treatise on sustainable development for a limited audience of academics, or he could present a drama in which the real-life pressures of greed and politics act upon a resource as precious as beautiful land. In his book Alterio’s Motive, Culberson manages both. And, while a work of fiction, the book also touches upon issues seen in the news today—especially when it comes to conflicts between developing or exploiting land and leaving it pristine. Through a plot that involves a villain who literally feeds his enemies to the sharks, and a piece of land off Mexico’s Caribbean coast that may or may not be turned into “the next Cancun,” Culberson successfully uses his years as a sustainable developer to come up with a page-turning thriller that keeps readers engaged while opening their eyes to these wider issues. In the FULL INTERVIEW, Culberson discusses his “day job” as a sustainable developer and the process of writing a riveting thriller and answers the following questions. •Development issues, especially in today’s polarized political climate, are often framed as a choice between nature and human habitation. Does it have to be a choice? Can we have both? •Tell us about your work as a sustainable developer, yourself. You describe your Brickyard Creek Community in Wisconsin as an “environmental residential community.” What does that mean and what is the philosophy behind the development? •Why are you using fiction to illustrate challenges associated with development? Why not write nonfiction? What is it about telling a story that appeals to you? •There are three major points of view in this book. Total development, sustainable development, and no development. Are these the major elements at play in real life? Are there times when one should win out over the other two? •When did you first realize that you could be a sustainable developer? Was there a moment in your personal or professional life? •Writing a book and planning a development: are they alike in any way? You can learn more about (and order!) 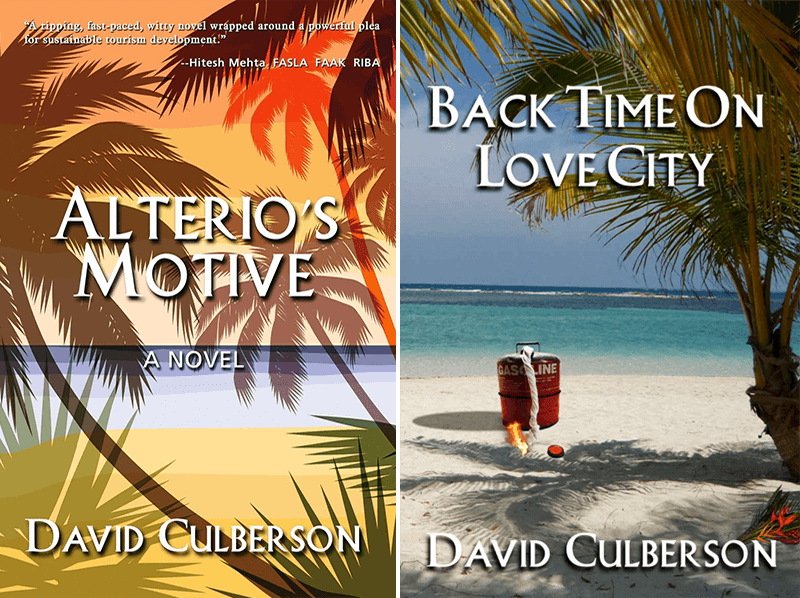 both of David’s books, Alterio’s Motive and the recently revised and republished second edition​ of Back Time On Love City on Amazon and other online book distributors. A third novel will be coming soon! The BYC Vision Committee invites you to Check Your Pulse, consider these guiding questions, and share your responses with your neighbors on our BYC Community website. What makes Brickyard Creek special? Do you need some inspiration? View the work shared by other community members found in the BYC Library. If you are willing to share your responses to these original guiding questions with your neighbors, please send them to the BYC Manager, Jeffery Garrett for posting here on our BYC Community website.